When It comes to my birthday no matter how old I get we have a small family tradition of going out for a meal, I now start choosing places that my parents will like rather than myself. I was with my brother and parents so four of us. 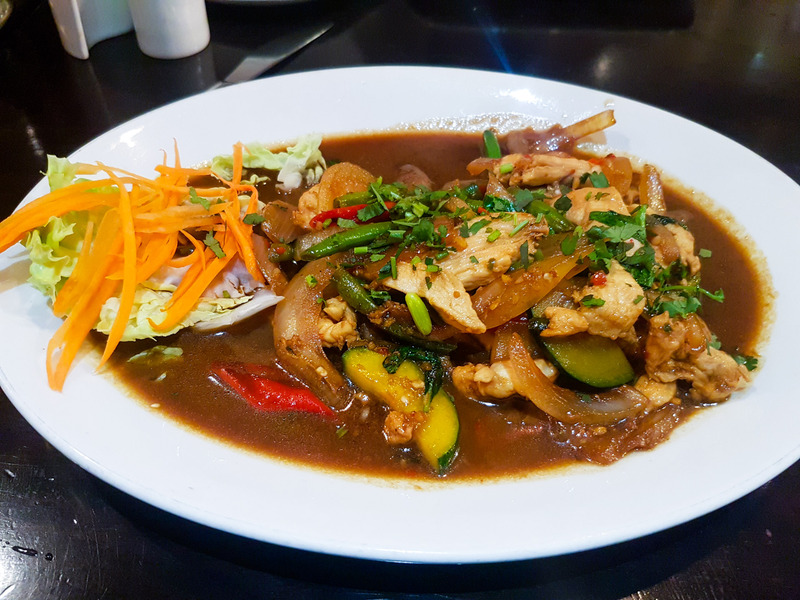 Thai n Pie is a humble Bengali run restaurant in Whitechapel that has a ‘jack of all trades’ menu, from typical Thai dishes to English pies, the clue was in the title, but they also offer grilled steaks and burgers. We decided to stick to Thai food and pies! The restaurant is deceptively spacious and has a large basement seating area. 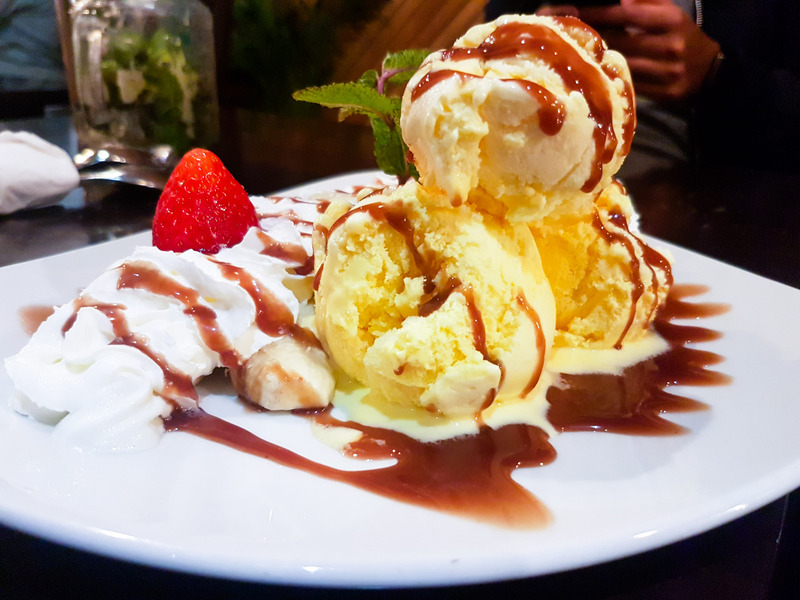 The decor is modern and clean throughout and has a welcoming atmosphere that caters for families, couples, small groups and large get-togethers. I’ve been to Thailand 4 times, I’m a massive fan of the food from south-east Asia. 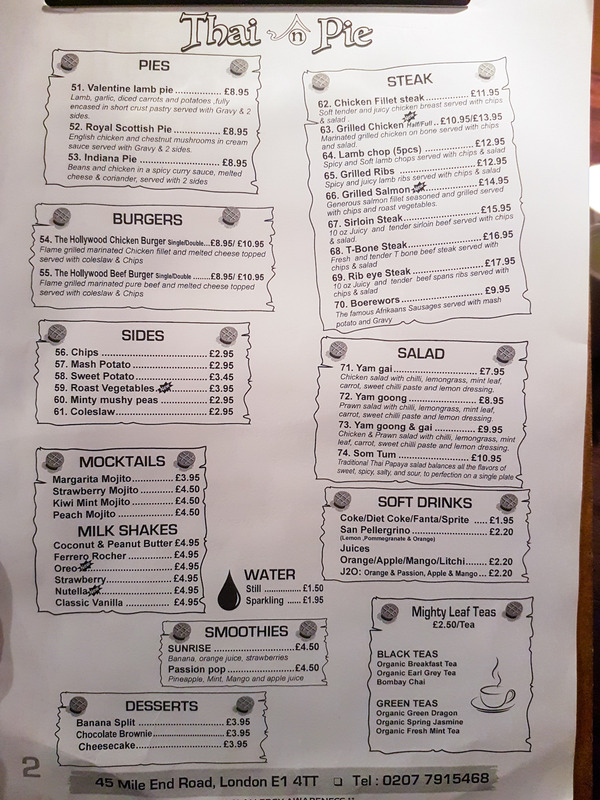 The menu offers up a lot of choices but after some tactical ordering, we got the following. 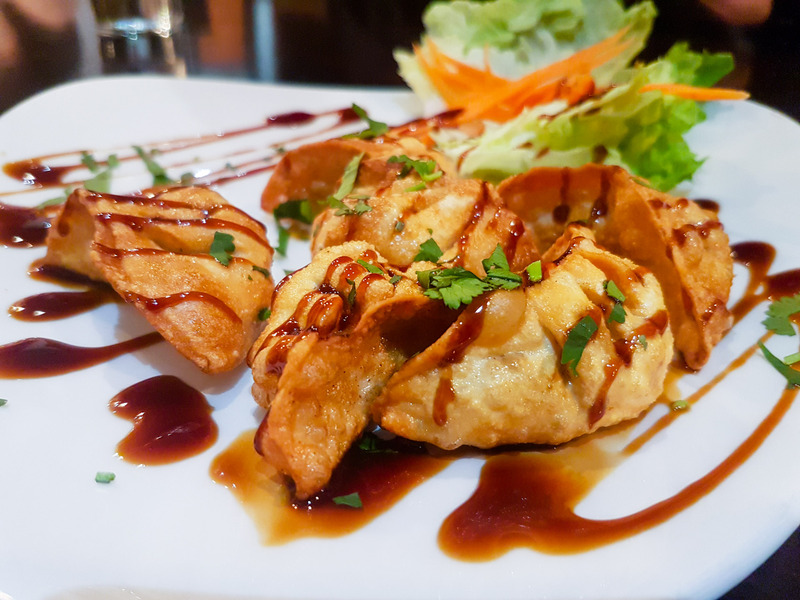 We started with some beef wontons, they were smaller than what I’m used to getting but were a nice simple start to the meal. We also got some gyoza, a simple but tasty dumpling. At this point my mum liked to embarrassed me and make sure the waiters know it’s my birthday, her idea is we would get better service and maybe some freebies. Well, her cunning ploy may have worked because we were then served with a complimentary serving of Tom yum soup. This was absolutely delicious. It has an ocean level of depth in flavour and the heat from the chilli was very hot and intense. Highly recommended. My dad actually ordered number 33 on the menu, however, we got 32. It turned out to be a welcomed error. My dad loved this dish. It’s something I’ve actually made at home myself. The chicken was well cooked and a lot of fresh ingredients used to give a good experience for my taste buds. Worth mentioning that the server already instructed the kitchen to fire up the correct order once we told him that it was the wrong dish, but again, we didn’t want to over order and waste food, plus my dad was happy with the mistaken order. 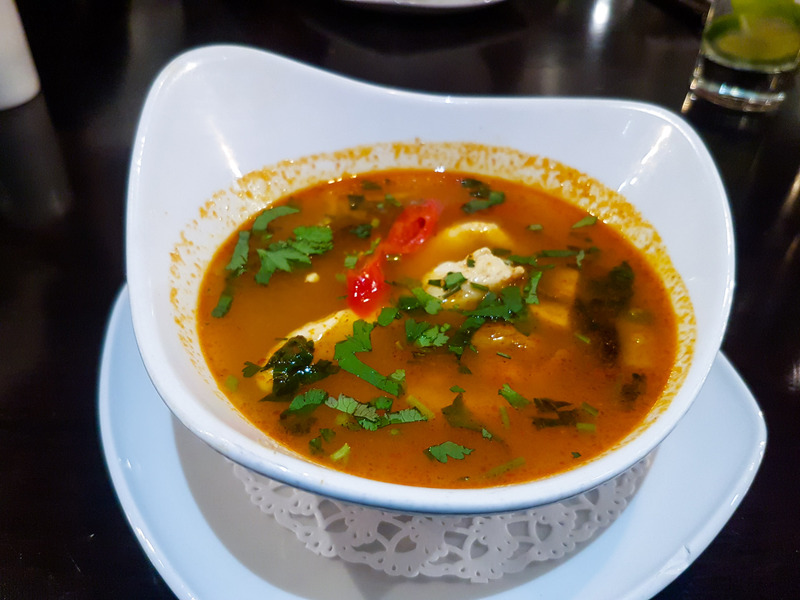 I got the red curry, with the choice of beef, I’m not sure why I got the beef, I know that prawn is always the best thing to get, but I knew I was making a prawn dish the next day. 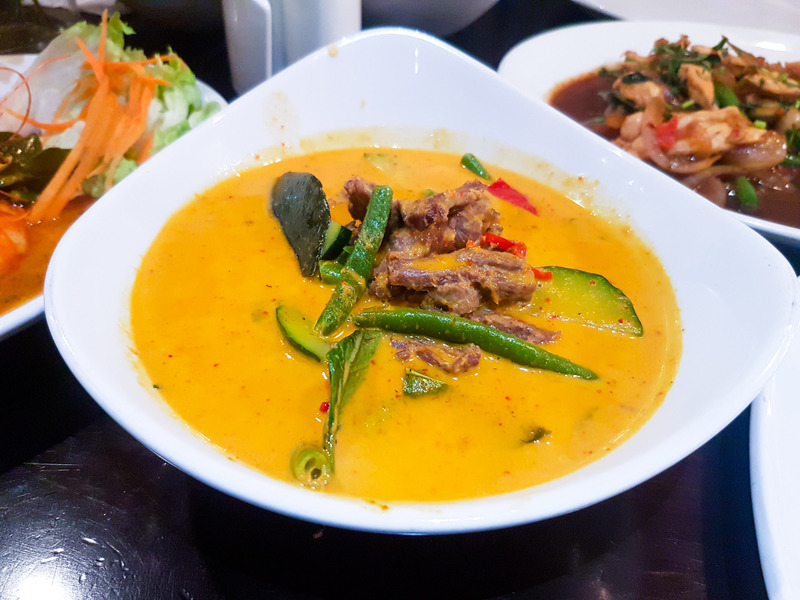 The beef was overcooked and too chewy, something I experience whenever I get the red curry with beef, clearly I have not learnt anything, however, the taste of the curry was good, a nice balance of heat and flavour. Our server did offer to change the curry for prawn without any fuss, but I knew I wouldn’t be able to eat another one and didn’t want to waste. But customer satisfaction was very important throughout the night. My Mum likes when she can see pictures of food before she orders. When you walk in there’s a screen with a cheesy slideshow of menu items, but one dish caught my mum’s eye and she said, yep I want that one! Turns out she’s got expensive taste and ordered the most expensive item on the menu, only £15, so not really “expensive” per se. 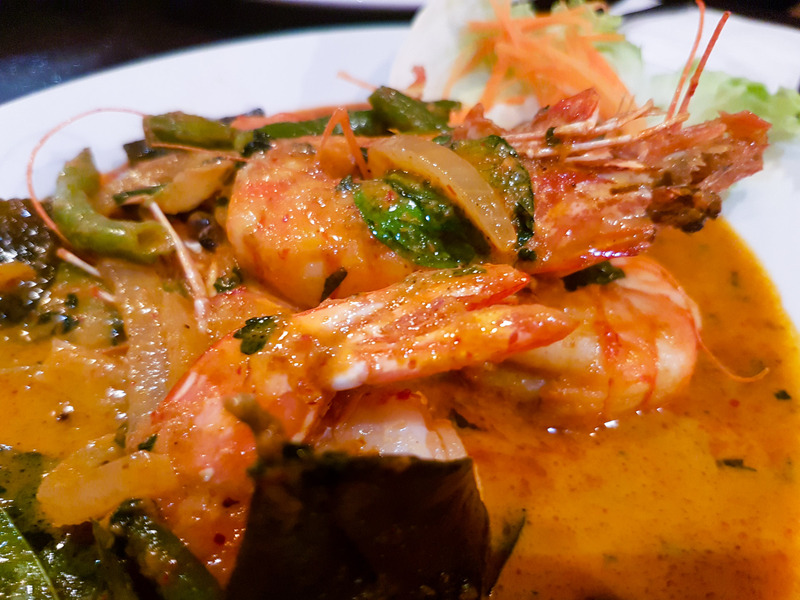 The black tiger prawns with a red curry sauce, similar taste to the red curry but no coconut and a sharper flavour. The prawns were massive and delicious. The pie came with the choice of 2 large sides and an odd inclusion of grapefruit. 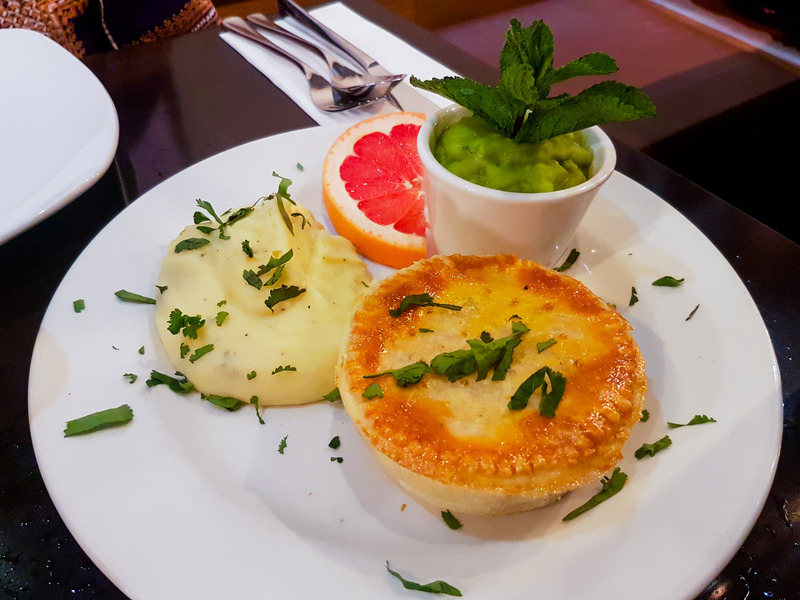 The pie itself was good, I only had a little bit, but the filling was on point for a chicken and mushroom pie and the sauce was creamy and mild with flavours that balanced well. For dessert, we got the chocolate brownie and the banana split. 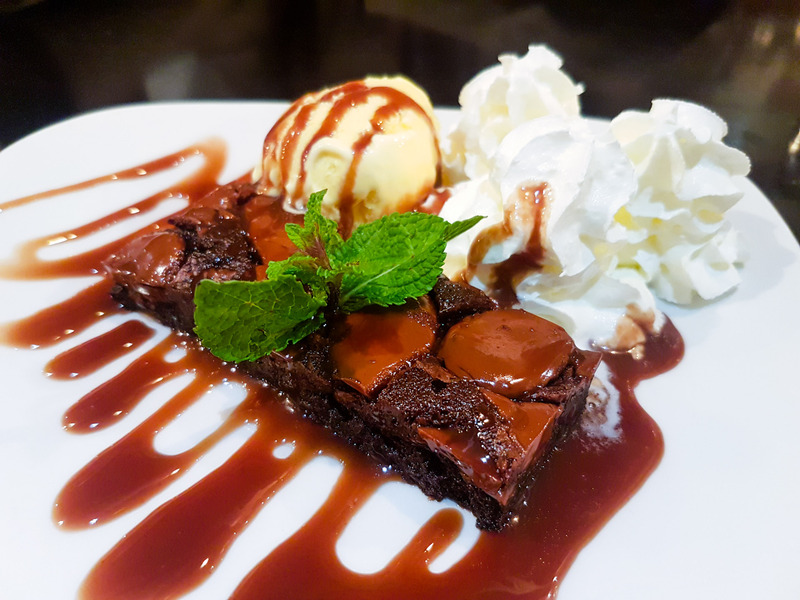 The brownie served warm with ice cream and was sweet and very gooey, really enjoyed this. The banana split was basic, just a cold banana with cream. These were given on the house, happy birthday to me. Overall, I was pleasantly surprised with the food I had here. It helps that they actually have a Thai head chef who handles the Thai dishes. The service was very friendly and I liked how our server spoke with my parents and gave them a nice complimentary cup of tea. Now, full disclosure, the staff did know I was halalfoodguy, so I know the service was extra attentive on this occasion which I’m sure was a factor. I also received an unexpected discount along with the complimentary items I mentioned so the total was £40. However, having spoken to a close friend, they said that when they visited, they too received a free Bananas split and good service. 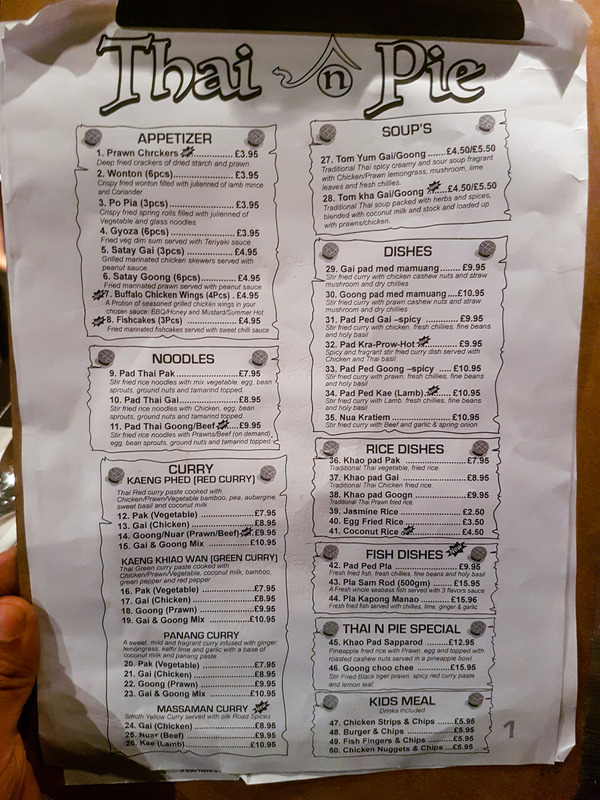 Hey Buddy!, I found this information for you: "Thai n Pie". 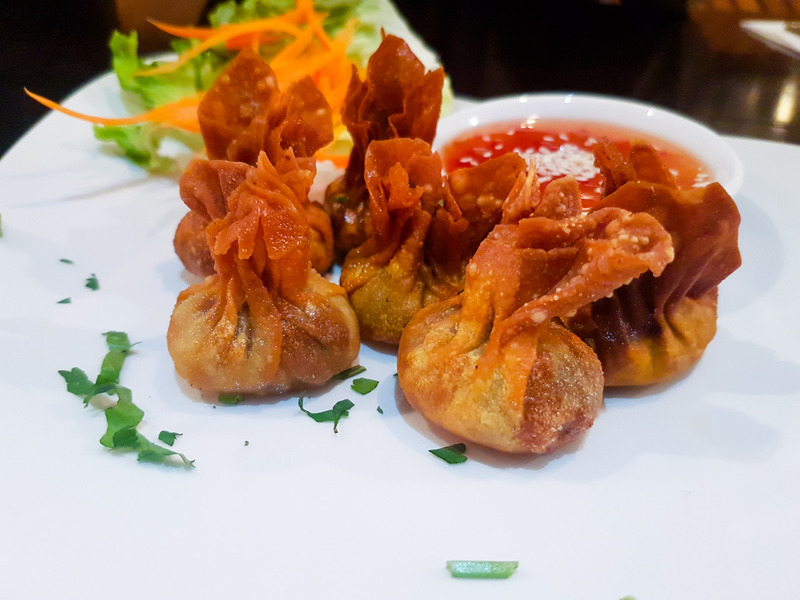 Here is the website link: http://halalfoodguy.co.uk/thai-n-pie/. Thank you.